A few years ago, I wrote about an interesting phenomenon called zoopharmacognosy. The idea is that animals might select specific plants or other substances to eat that would have therapeutic effects. An example might be an herbivore with a heavy parasite load eating a plant it doesn’t normally use as food but which happens to reduce the number of those parasites. It’s a popular idea among proponents of herbal medicine and folks who think the word “natural” is a meaningful guide to effective medical treatment because it reinforces their existing beliefs. However, the reality is a lot more complicated than such people seem able to admit. There is some evidence that animals in the wild sometimes select plants to eat that might have health benefits. The best evidence comes from insects and other species with short generation times that produce large numbers of young and have rather simple, predominantly genetically determined behavior. Evolution can quickly select for changes in behavior that have a selective advantage in such species because small changes can readily spread if they give even a little advantage to a few individuals, and behavior is not very flexible or complex and so can be altered by small genetic changes. There is much less reason to think zoopharmacognosy is a common or effective behavior found in more complex species, such as mammals. Most of the claims for this are simply uncontrolled observations with lots of assumptions and bias built in. And proponents of this idea generally ignore the fact that the availability of potentially medicinal plants is unpredictable, their composition and effects vary from plant to plant, region to region, and year to year, that we don’t have actual evidence for the real value of most plants considered “medicinal” by various folk medicine traditions, and finally that wild animals poison themselves or ingest non-food objects with deleterious consequences, which argues against a strong and reliable intuition about what is healthful. Nevertheless, it should come as no surprise that not only do some alternative medicine proponents claim that zoopharmacognosy is an established and widespread phenomenon, rather than an interesting and largely unproven idea, they also use it to validate other ideas that are just as unproven and often even less plausible. Sadly, some even manage to profit from selling the idea, and a host of bogus remedies based on it, to pet owners. One such person is Caroline Ingraham, the proprietor of the grandly named Ingraham Academy of Applied Zoopharmacognosy. 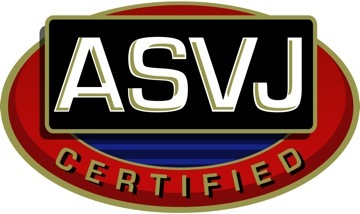 The Ingraham Academy of Zoopharmacognosy, headed by the founder of Applied Zoopharmacognosy Caroline Ingraham, promotes self-medication as a necessary component of domestic animal health and trains individuals in how to enable and recognize self-medicative behaviour in animals. Since it is not at all clear that zoopharmacognosy is a real or significant phenomenon among wild or domestic animals, claiming to teach people how to take advantage of it as a “necessary” part of their animals’ care is quite a stretch. Caroline Ingraham founded Applied Zoopharmacognosy and is the leading expert in this field of animal self-medication…. Caroline has featured in many scientific journals and articles, and has written numerous books on the subject. At 22 years of age, Caroline studied the clinical use of essential oils for humans with one of the world’s leading experts in aromatherapy, Robert Tisserand and during her studies began to develop her approach towards helping animals using essential oils and other plant and mineral remedies. She later went on to study the French approach to the scientific use of essential oils with EORC (France) and Biologist Thomas Ingraham. Her work encompasses an understanding of pharmacokinetics and pharmacology combined with animal self-medication. In addition to classes and books Ms. Ingraham happens to sell the remedies she suggests you let you pet choose among. These include essential oils and a range of plant-based products in various forms. Which raises the first of many problems with Ms. Ingraham’s claims: What are the “medicines” are we supposed to offer our pets? There is no evidence for any meaningful medicinal value to the vast majority of the products that she sells. There is weak evidence for beneficial effects on subjective mood states, such as anxiety, in humans, but the notion that they can influence the outcome of serious diseases is entirely unproven and highly implausible. (1, 2, 3, 4). And as I have discussed extensively before, herbal medicine is a complex subject, but the bottom line is there is no herbal product proven to have meaningful benefits for serious disease in companion animals. Most herbal products are untested and unreliable in terms of constituents. And there are serious risks to using untested and unregulated plant-based medicines. So whether or not your pet knows what they need to get better and can tell you, how is it helpful to offer them a selection of remedies that haven’t been shown to actually work? Of course, the underlying reason for this is far more pragmatic. Not being a veterinarian, Ms. Ingraham cannot employ most medicines that have actually been proven to work. And even the “Founder of Applied Zoopharmacognosy” would likely admit that offering a selection of antibiotics, cancer drugs, pain relievers, and so on and letting your pet decide which drug it needed and how much to take would likely not result in a desirable outcome. That would demonstrate real trust in their inherent wisdom! 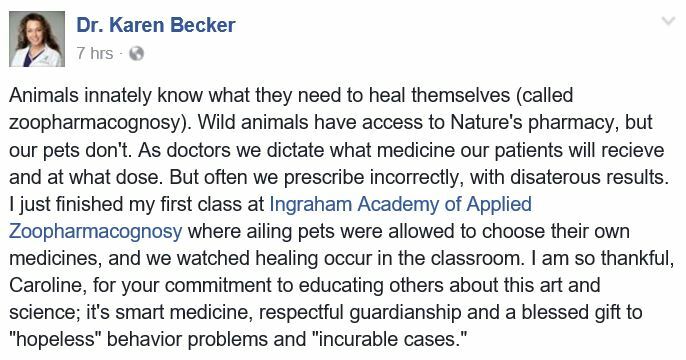 Undoubtedly, she would claim that this is different from what she recommends because pharmaceutical medicines are “chemicals” and are not “natural” so the inherent wisdom of animals to self-heal doesn’t operate with such remedies. That’s not a convincing argument, especially given that we at least we know the risks and benefits of real medicines, and feeding our pets her essential oils and ground-up leaves is just playing roulette with untested chemicals. The method by which Ms. Ingraham suggests our pets can indicate their choice of “remedy” is another problem with her approach. Even if our pets have a preference that is meaningful and appropriate (which has not been demonstrated), it is naïve to imagine that we can read our pets body language with a level of specificity that we can tell which remedy that want without introducing our own bias or influencing their behavior. Studies of drug detection dogs have shown that dogs are very sensitive to human expectations and will often misidentify substances they are supposed to search for when their handler has a pre-existing and incorrect belief about where drugs are located. And the caregiver placebo effect is a well-known phenomenon in which owners and veterinarians see what they hope or expect to see in their dogs rather that accurately observing their behavior. The work is all about not rushing, and closely observing your dog. This list has all the specificity of a horoscope or a homeopathic proving. A lack of interest is a negative sign, but a vacant look is a positive sign. Lunging at the remedy indicates selection, but so does backing away from the remedy. Even blinking is supposed to be a positive sign! Clearly, this is a perfect example of the use of vagueness to allow any interpretation the person making the claim desires to be supported. It is exactly the sort of self-deluding approach to animal behavior that lets pet psychics and their clients convince themselves that bit of magical nonsense is real. Of course, any claim that our pets know what’s good for them and choose to eat the healthiest food or most appropriate medicinal plants has to consider the inevitable question of why, if they are so wise, do our animal companions try to kill themselves by eating socks, batteries, massive overdoses of medication, their own feces and vomit, and any number of other distinctly unhealthful substances? Ms. Ingraham’s response to this question also strikes me as pretty unconvincing. Basically, she claims that our animals may be too hungry to resist toxic plants, that they are fooled by “artificial” chemicals or other substances, such as sugar and flavorings, into thinking unhealthy substances are good for them, or that in nature they would eat a natural “antidote” to a toxic plant after eating that pant but that they don’t always have access to such anecdotes in captivity. 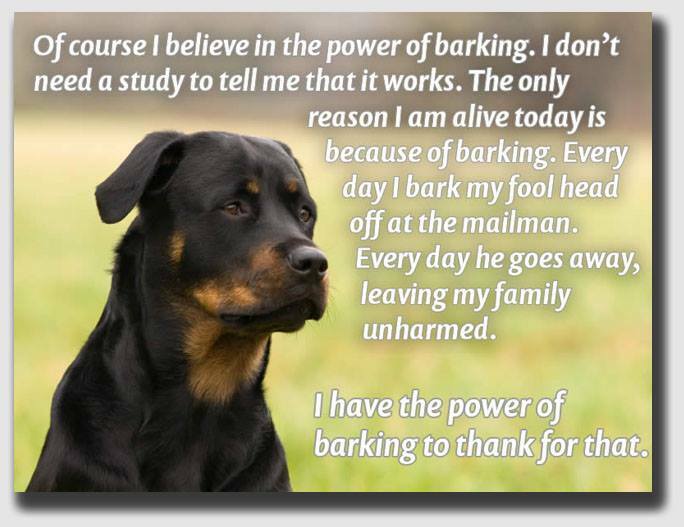 None of this reasoning makes much sense, and it ignores both the self-destructive ingestive behavior seen in wild animals as well as the impact of domestication on the physiology, diet, and behavior of many animals, such as dogs and livestock. There are a number of ways in which the idea of “applied zoopharmacognosy” can be harmful to our pets. For one, the remedies Ms. Ingraham recommends are largely untested, and this means not only that they might not be helpful but that we can’t assume they are safe. As I’ve pointed out many times, plant-based chemicals can do plenty of direct harm. Perhaps the greater risk is the indirect harm caused by relying on nonsense instead of seeking legitimate medical treatment. This is exacerbated by suggesting that this method at be more reliable than conventional medicine, as the ever-unreliable alternative medicine advocate Dr. Karen Becker has done. The following testimonial is a particularly chilling example of how dangerous this sort of delusion can be. A student of Ms. Ingraham describes her use of the nonsense she was taught to treat what she had good reason to believe was a potentially life-threatening illness. The fact that the owner got away with this response to what might have been a deadly illness does not justify it. 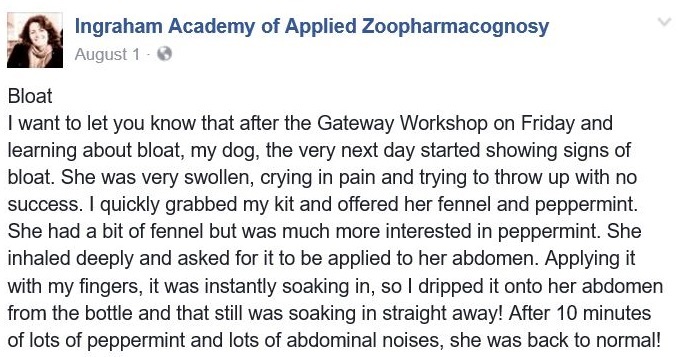 The fact that Ms. Ingraham has chosen to post this testimonial on her Facebook page as part of the process of advertising her services suggests she may recommend or approve of using her method and her products in place of proper veterinary care, even in potentially life-threatening situations. That is certainly the impression her student acquired in her class. If this is true, it is a dangerous and irresponsible practice. There is little evidence that selection of medicinal plants or other substances by animals in their natural habitat or by domesticated animals is a common behavior with substantial health benefits. Zoopharmacognosy is an interesting phenomenon, but there is very limited evidence for it in most species. Wild animals are generally less healthy and shorter-lived than domesticated animals provided conventional healthcare, nutrition, sanitation, and other basic husbandry, so the concept Ms. Ingraham is selling is mostly a variety of the appeal to nature fallacy. There is also virtually no evidence that the use of essential oils or many of the plant extracts Ms. Ingraham sells is safe or effective for any serious health condition. Aromatherapy has not been shown even in humans to have significant health benefits, though there may be some mild psychological effects, and in veterinary species there is no reason to think essential oils can dramatically improve health. Likewise, while herbal medicine is a bit more plausible and promising in some ways, it has largely failed to prove its worth in controlled scientific research, and most of the herbal and other plant remedies Ms. Ingraham sells and recommends have not been proven to have value or even to be reliably safe. The process of letting our pets “select” a remedy is subjective and deeply vulnerable to bias and caregiver placebo effects. Most importantly, Applied Zoopharmacognosy is yet another unproven and implausible practice that places pets in danger when it is used as a substitute for real veterinary care. Even if the remedies themselves are harmless, which is not certain, the example above illustrates how it can be very dangerous if people are led to believe that these methods and products can replace appropriate medical care. There are certainly essential oils that can affect humans as there are some pregnant women are told to avoid as they can act as abortificants, so I’m sure there are essential oils that can have effects on animals, but letting them choose which one is just daft. And quite apart from the likelihood of the dog in that testimonial dying if it had really had bloat rather than (liekly) wind putting undiluted essential oils on human skin can burn it and I doubt a dogs stomach skin is any less sensitive. I would not be surprised if it was found that particular species ate foods that say did to an extent limit their parasitic load, but that is a very different idea from an individul choosing medicne for what ails it. Just because something is natural certainly does not make it safe. Essential oils can be very harmful if not used properly and diluted appropriately. If anyone has ever seen an animal suffer from bloat they would certainly not waste a minute on a “treatment” that has no proof of being effective and could actually cause more harm. I find the ignorance and “care” of the person who used peppermint oil down right cruel. She is nothing more than lucky that the dog obviously wasn’t dying from torsion. Having lost 2 dogs to that I am infuriated at her neglect. It’s a painful way to die. Having 2 dogs now with IBD, the slightest discomfort has us running to the vet out of fear that I may be complacent thinking it’s only a flare up and it actually being more than that. I’m not against using alternatives. I have had tremendous success consulting an integrative vet for many of my pets’ conditions. But I wouldn’t completely give up the tried & true, science-based treatments. One other thing about Dr. Becker. I often look at her point of view on things, but I would never follow her advice to a T. There are some things that she discusses that seem spot on and make sense (like the calcium: phosphorus amts for LBPs). But she does seem to have an agenda. I don’t think I have ever read an article that didn’t push raw feeding and/or a product. Dr. Becker just seems a little extreme and rigid in her philosophy of certain things. I’d prefer if she was as open to science-based medicine as she is to anecdotal cases. That’s naive and, as a vet, irresponsible. I am very saddened by your polemic, which unfairly misrepresents this work. I am a trained, academic, scientist. I do not fool with dangerous alternatives to necessary veterinary treatment for any of my animals. What I do do, and have done with both fascination and effectiveness, is offer herbs and essential oils as complementary therapies. Disagree with what Caroline Ingraham and others say, if you wish – and if you have contrary (rather than an absence) of evidence – but please do not dismiss out of hand something which, so far as I can tell from your writing, you have not actually tested. Thank you. I’m afraid your assertion that my article “unfairly misrepresents” the claims Ms. Ingraham and her supporters make is simply inaccurate, and clearly it reflects the nature of your feelings about my conclusions more than the nature of my argument. I have honestly represented and evaluated the claims made, and they are, as I point out, not consistent with reality. My dismissal of this nonsense is not “out of hand” but follows careful consideration of the claims, the available evidence, and the extensive knowledge of physiology, pharmacology, and animal behavior I have as a function of my studies and my profession. You may dislike what I say, but it is you who are misrepresenting what you disagree with. As for the question of evidence, you are mistaken on two major points. The first is that when someone makes a implausible and unsupported medical claim, it is their responsibility to prove it with appropriate evidence. It is not safe or wise to expect that the rest of the world will either accept the claim to be true or that the rest of the world must take the responsibility to test it and prove it untrue. It is not my job to generate the evidence for or against Ms. Ingraham’s claims, it is hers. And since the only evidence she provides is intuition and anecdote, it is perfectly appropriate to reject this evidence as insufficient to support her claims. The absence of scientific evidence, any apparent interest in producing any, and the inherent inconsistency of these claims with established knowledge of how animals behave make a fair and powerful case against her claims. This could be overcome by sufficiently strong evidence, but until some is produced by those making the claims, no one else is under any obligation to take them seriously. The second error you make is assuming that the appropriate way to test a claim like this is to follow the method and see what happens, which is what I suspect you mean by suggesting I haven’t “actually tested” it for myself. That is how we used to evaluate medical claims, and it gave us thousands of years of useless practices, from bloodletting and magic rituals to homeopathy. Then we discovered the advantages of controlled scientific evaluation over anecdote and trial-and-error, and the improvement in our health and longevity has been enormous and unprecedented. Therefore, neither the argument for this method, nor the criticisms against it, should rely on personal experience and anecdotes but on scientific evidence. And, as I’ve already said, there is none to support the frankly nonsensical idea. You may not substitute this bizarre practice for legitimate medical treatment, but clearly others do, and this is what should truly disturb and sadden you. Yes, people often feel that way. It’s a shame since personal experience is deeply unreliable and often leads us to false beliefs and bad choices. Accepting our own limitations and the need for science not just stories is what has allowed all the achievements in health, medicine, and technology of the last couple of centuries and the overcoming of sources of suffering and death we failed to beat in thousands of years. Yet our brains are wired to believe what we think we see whether it’s true or not. So on this occasion my personal experience is not wishful thinking nor ignorance, it worked !! It is an interesting observation to note that certain illness, cancers and tumours are on the increase in animals and humans. Science has done much to help in some ways, and held us back from going forward in others. There are many things science has done that has caused much harm to the natural world, to the food we eat and the water we drink. Science is not all good. I live on a farm and years ago you could walk down the hedge-rows and pick all the wild fruit that grew, now there is none. The reason is the neighbouring farmer sprays his fields and the drift has killed all the native plant species. It is time for people to stop been so negative and to wake up to reality, this is not a battle and I do not want to enter the battle field that has been set here because I have witnessed and experienced the healing benefits of Caroline’s products when veterinary medicine could not help. Surely to God we should be on the same side, and that is to study what IS beneficial and what DOES work. Together science and the naturist could do so much good, but when you get someone who has they own inner dislike towards something they un-do so much good work. We have one world, we should learn to use it wisely. There is no separation in nature or notion of ‘me’ who stands alone. Everything is inter-connected and we would be wise to remember that before we destroy everything. What I would say to Skeptvet is “why don’t you put your weapons down, and walk in peace?”. Science is neither “good” nor “bad.” Science is a tool, a process for understanding how the natural world works. It is more reliable than just observing and guessing, but we are responsible for the choices we make with the knowledge science provides. The idea that people have done bad things with technology doesn’t change the fact that only through science do we gain a sufficiently detailed and accurate understanding to develop technology, with both its risks and benefits. You miss the point entirely when you say “We should study what DOES work.” This assumes you already know something works and science is an afterthought. Until proper methods are used, you only believe something works, and such beliefs have proven mistaken so consistently throughout history that the proper position is “We should study what we believe to find what works and what doesn’t work.” But working together requires agreeing on a method. If you believe trial and error or your personal judgement is accurate and I believe it is deeply flawed, then the difference in method is real and important. As for talk of “weapons,” this is silly poetic hyperbole. We are disagreeing about epistemology, about how we know what we know. Since when is disagreement=assault and arguments or evidence= weapons? Science meaning a careful study of how things actually work? You really want to be outside of science? So you like guessing and trial and error with precious lives? There is literally nothing in this universe outside of science! Our universe is physical and we are bound physically to its rules. For those of us who believe in a Creator, guess what, that means he created the physical universe and physical rules and subjected his physical creation to them. In that case spirit creatures would not be subject to physical laws. But everything else is. Including us and our pets and plants. Unless you’re suggesting spirit creatures help your dog choose the right plant. In which case the best place for you, for now, may in fact be outside of science. I forgot to hashtag #scietificliteracy for effect. Hi Meg Hare, have you been on one of Caroline’s workshops and listened to the scientific evidence behind her teachings? Science has only been around a very short time, nature has in fact been around 100,000 + years. You are made from natural compounds, not scientific ones. This is a very ‘blind’ argument that is happening here and one based on a very limited world-view. I am surprised, no, not really. Just look at what these views have done to, and continue to do to the world that has evolved without the hinderance of man made rules. Is it not time to wake up? and if not now, when? That’s really quite funny. what does “you are made from natural compounds not scientific ones” even mean? Nature has surely been around a lot longer than science (13.73 billion years, if you believe in the scientific theory of the origin of the universe, though it wouldn’t surprise me if you didn’t). But in all the thousands of years human beings lived without science, most of us died in childhood or childbirth or nutritional deficiencies and diseases none of us today have ever even seen. Science has done more in 200 years to improve our understanding and our well-being than anything in the hundreds of thousands of years before it. It’s just silly, and terribly arrogant, to imagine that what you think you know about “nature” is somehow an ancient wisdom that transcends science. Real humility and open-mindedness starts by recognizing how limited our individual experiences are and why they mislead us more often than not. Science is not as belief system, it is simply a tool to help us overcome our limitations. But first we have to accdept them, and it doesn’t seem as if you have. It is more than obvious through your attitude, and comments, that you have no intention of opening your mind. What do you eat each day? food from the natural world, or something created by science? Maybe if you pushed your scepticism aside you might learn something. I am interested to see the works you have brought into this world to bring knowledge to others, I am always interested in learning. Just last week my husband’s friends mother was taken into hospital and nearly died because the drugs she had been prescribed had laid in her stomach and not dissolved, then they dissolved together nearly killing her. We are all learning all of the time, aren’t we? I know this has nothing to do with this thread as such, but BSE was created by ‘the mad scientist’ who thought feeding sheep to cows was a good idea. There are rules in nature and I have never seen a cow chasing a sheep around and eating it. Where do some of these ideas come from? There is a natural law for a reason. Yes, nature is cruel sometimes and survival can be very hard for people and animals. 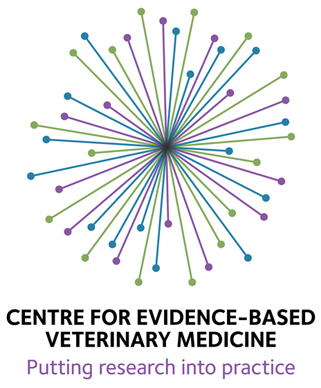 As humans we can bring so much into the world regarding health and welfare for people and animals, and sometimes science has helped enormously, other times it has got it wrong. Getting back on track, what Caroline does is ‘an evolving science’. Surely you can see some good in her life’s work, just look at the videos and I can give you plenty of examples where her work has literally saved animals in my care when the vets could not. I work together with my vet who is open minded and helpful. If everyone were open minded the world would be in a very different state because we would be listening, opposed to throwing our own views out and expecting everyone else to adhere to them. Ego is a funny thing we have to get a handle on, all of us. With warmth and trust, because I believe you feel you are doing the right thing, but please look through two eyes, not one. I opened mine to science a long time ago and can see it’s benefits too, despite what you think. Science is not a mythical paradise like your naive vision of “nature.” It is just a tool for understanding the world that exists. You have cocooned yourself in a dream world built out of the Appeal to Fallacy, and you simultaneously close your eyes to obvious facts while judging yourself more enlightened than anyone who disagrees with you. And yet you think the arrogance and closed-mindedness is in those who don’t buy into your naive fantasy. Such a perfectly untouchable, self-righteous, and self-sustaining setup it might as well be a religion. It seems you are so far away from what I am trying to convey and that is a shame, we could have learnt from each other. I respect nature, yes, because nature is Life. Without nature there would be no life. I respect people too who spend their time looking for ways to make the experience of Life better for all beings. I am interested in what it means to be human and how we can become better human beings. I do not see that as cocooning myself in at all, to the contrary, I see it as embracing all Truths. When I prepared my dinner this evening I was more aware than ever that everything on my plate came from nature, and I was aware of how science had given us the tools to get that food to my plate. These conversations have made me more aware of how the paths of science and nature cross, and if we are coming from a place of learning how beneficial that can be. The problem happens when we look at anything in isolation, whether that be science or nature. That is why I believe in integrative medicine. We have, for a very long time, underestimated the intelligence of animals, this is a fact. W have used and abused many, and still do in the name of progress. Chicks are shredded as they are hatched, or dumped in bags to suffocate and die. Is this nature or science? or is is just human nature? There are so many things out of balance which cause much harm in the world, are these not the things we should be concentrating on changing? Hello Yvette, I too have found the Green Clay to be amazing. It saved one of our Rams last year who had fly strike really badly. He was initially sprayed with a spray from the vet and he reacted badly to it and the whole one side of his body, his skin, literally peeled away down to about half inch. He was in a terrible state and we thought he would die, but I remembered seeing a video of Caroline treat a Lioness who had been gored by a water buffalo with Green Clay. I applied the Clay and within 24 hours our Ram had started to make a recovery. He went on to make a full recovery and reclaim all his coat. I have used it many time on our farm and it is, without a doubt, incredible. It is nice to hear you have also had the same outstanding results. Thank you for sharing. The commenters above need to spend a week in a veterinary emergency and critical care hospital and learn what gastric dilatation-volvulus (GDV aka bloat) is, the excruciating pain a dog suffers and the treatment and surgery the dog will have to endure, and to see that for every 3 dogs, 1 may die before surgery or from complications from shock and heart failure. THERE IS NO ALTERNATIVE TREATMENT FOR BLOAT. The so-called testimonial that Ingraham posted was a complete fabrication. Bloat is almost always a potential deadly condition that requires immediate veterinary attention. Ingraham has pretty much fabricated everything that comes out of her delusional mind – believe in unicorns and fairy dust, that’s your choice, but your pet deserves treatment from a qualified vet who understands a health condition and treats the condition with evidence-based medicine. THAT is what your pet wants and would tell you if he/she could. It’s mind-blowing that pet owners could ever believe that essential oils (toxic to pets, ask a veterinary toxicologist, not a quack on the net), untested ground up plants, homeopathy and other woo could ever treat or cure a pet’s health condition. To those who cry “open your mind”, I say to you, open your eyes to this fraud! Thank you for the links SkeptVet, I will take a look at these tomorrow. I found your article very interesting, but would point out that (as an Animal Therapist myself) I would NEVER treat an animal without first recommending that they see a vet if there is a medical condition present. I am not a vet, I can not diagnose any medical condition and it would be wrong (not to mention against the law) for me to do so. But, I do feel that any animal therapy – be it zoopharmacognosy, aromatherapy or any of the other therapies being promoted – have a place alongside main stream veterinary treatment. When you disregard “natural” remedies, you seem to forget that many of the medications that we and our animals take now are based on a natural remedy. There is a place for both a natural approach as well as a medical one. A bit late to the party here, but I was reminded of an incident a few years ago involving a woman I know who practiced this and did her best to rope everyone on our livery yard into trying it. Most of the horses showed little interest, although just looking at the pots of herbs was evidently enough to indicate they ‘needed’ it. Then came the turn of my pony, who took one look and in about a minute managed to eat a good portion of this woman’s very expensive herbs. For some reason she wasn’t terribly happy about this, while everyone else was in stitches laughing. Pony was also very happy with her impromptu snack. Needless to say, no one else took up this hobby. While some plants might have benefits and could certainly do with being investigated properly, expecting animals, many of whom are extremely greedy and naturally impulsive is just asking for trouble. I’d love to know where they draw the line. Would they recommend I should let my dog eat the pigeons and rats she has found over the years? Or maybe the pony that broke into the orchard just really needed the windfall apples, nevermind that he ended up with (thankfully mild) colic.